Cruise control gives drivers the ability to take their foot off the gas pedal while keeping their car moving at one set speed. This technology has been advanced over the many decades it has existed. Now you can find cruise control systems that ensure safer driving in addition to speed control. Below is a list which summarizes the 10 biggest benefits of cruise control. 1) Save on Gas – Every time you step on the gas pedal to accelerate your vehicle, it consumes more gas. Since cruise control keeps your vehicle moving without requiring you to step on the gas pedal, you won’t be consuming as much gas. As a result, you will be saving money on gas because your miles-per-gallon will be higher. 2) More Fuel Efficiency on Interstate – Interstate driving involves driving consistently at higher speeds for longer periods of time. 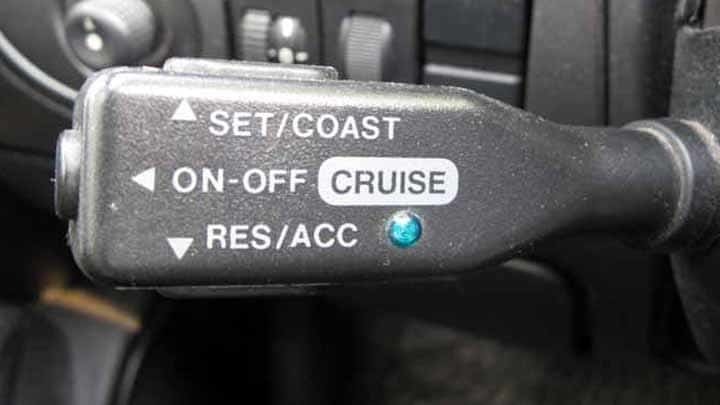 With cruise control set, you will have more fuel efficiency on the interstate because the engine is consuming the gas at a set pace without too much demand being placed on it. This means that you’ll be saving gas if you frequently drive on the interstate. 3) Reduces Fatigue – Every action you perform while driving a vehicle can wear you down and make you feel fatigued. The great thing about cruise control is that it doesn’t require you to worry about stepping on the gas pedal to accelerate. Instead, you only have to focus on the steering. This limited action needed will reduce driver fatigue behind the wheel. 4) Avoid Speeding Tickets – Many people will often drive faster than the legal speed limit without even realizing it. This could be a costly mistake if you get pulled over and issued a citation by a police officer. Cruise control will prevent this mistake from happening because you can set the speed to the proper speed limit and avoid accidentally going too fast. 5) More Focus – Cruise control takes over the acceleration of your vehicle after it is set. Because of that, you can put more of your focus on the road and your steering. Then, if there is an obstacle or turn that you have to make, you will be able to notice it faster. 6) More Comfort – It is easy for your foot to get tired as you’re driving because you have to constantly be pressing it on either the gas pedal or brake pedal. If you have a long drive, it can become tiresome for your foot to keep doing this. Cruise control helps give your foot a rest because you can keep it down on the floor as you’re driving rather than on the gas pedal. 7) Easy to Disengage – As soon as you put your foot on the brake pedal, it will disengage cruise control and you will go back to manual acceleration again. You also have options to do this on your dashboard as well. 8) Dynamic Set Speed – Some cruise control systems have a feature which can set the cruise control speed of the vehicle by using GPS technology to read the speed limit signs near your location. It will then adjust the cruise control speed according to what the posted speed limit is for the road that you’re on. 9) Automatic Braking – Some cruise control systems have sensors which can detect how close you are to the nearest car in front of you. That way, if you get too close to the vehicle while your cruise control is on, your vehicle will automatically slow down to avoid an accident. Once the other vehicle goes away, the cruise control will reactivate the previous speed again. 10) Forward Collision Warning – If your cruise control system doesn’t have automatic braking, then it may have a forward collision warning feature instead. This feature will warn you if your vehicle is getting too close to the nearest vehicle in front of you.